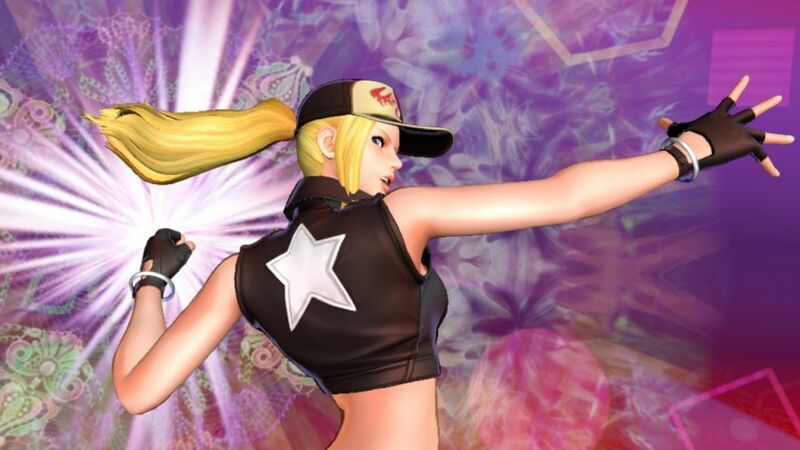 SNK Heroines -Tag Team Frenzy- is a two-on-two tag team fighting game in the vein of Marvel vs Capcom – or if we’re staying in the SNK realm, The King of Fighters XI – featuring a collection of the ladies of the King of Fighters series, including a gender-bent Terry Bogard. The ladies from across the KoF universe – the majority of which are from the latest entry, The King of Fighters XIV – are sucked into a pocket dimension created by Kukri, a mysterious figure from North Africa, portrayed in this title as a massive pervert who wants to create sand sculptures out of the ladies who he rates a 9 or a 10. The ladies must fight to escape the pocket dimension and save the other KoF women fighters from the clutches of Kukri. Okay, okay. I know what you’re probably thinking: “This story is stupid,” right? It is. It isn’t the most stimulating story, but it is funny. I feel that’s what the writers and developers were going for with SNK Heroines, knowing that this game was going to be a fun little game for people to play casually. It’s so casual, that everything you do is tied to the simplest of button presses and combinations. There are a light and heavy attack, as well as a throw button and a special button to do your special moves. Guard is tied to a button, as is your Dream Special and your tag button. Everything is simple and easy to execute. You can certainly get some stylish combos out of the simplistic nature of the commands as well as keep it simple. It looks like Terry stole some sheep from Mui Mui Bo Peep. What’s awesome about SNK Heroines is the way that the life and Dream meters work. The match doesn’t end when your life gets to zero, which may confuse some people, but it’s easy to pick up. Once your or your opponent’s life bar get into the red, you are afforded a Dream Finish Chance. This allows you to activate your Dream Finish (when your meter is pink, not flashing rainbows) to end the match in a decisive fashion. As long as you activate and connect with the Dream Finish while the life meter (which is the smaller meter) is red, the match is guaranteed over and you move on to the next one. It’s such a simplistic mechanic and one that can be fully exploited with some crazy combos. However, the Dream Meter has a huge bonus, as well as a huge drawback. While your partner is tagged out, they gain meter at a significantly faster rate than the active fighter, setting up for some craziness towards the end. The drawback is that once your dream meter is depleted – which can happen – your special moves do nothing for damage. I’ve gotten caught in that significantly, and it hurt my chances of a quick finish unless I tagged in and out – which is recommended for effective meter management. The customize mode isn’t super deep, neither is the gallery, however, everything can be purchased using currency that you earn by playing the game, as well as wagering on online versus matches. I haven’t been able to test the online because the game hasn’t released yet, but an update will be provided once the servers begin to populate. Now for the bad. The game operates MOSTLY at 30 fps. The reason I say mostly is that there are moments where the game can hit 60fps. While docked, this is far infrequent, where the game stays mostly at 30fps, with the occasional spike to 60 during moments where there isn’t much on the game screen. Handheld, it spikes hard. When you get up close in certain stages, the game slows down to 30 fps, but when you move further apart to show off the whole stage, it speeds up to 60fps. There are stages where it’s all 60 or all 30, as well. Docked is certainly the best way to play, because of the consistency. That’s not to say it’s a positive. The fact that the game cannot maintain a solid framerate, docked or otherwise bothered me a little bit. Hopefully, there is a day one patch that fixes the issue, or a patch before Thief Arthur becomes available, however, the Switch version of the game suffers from framerate jumps something fierce. In addition, Kukri suffers from SNK Boss Syndrome, but this is SNK. I think we somewhat expect this. Review Disclosure Statement: SNK Heroines -Tag Team Frenzy- was provided to us by NIS America for review purposes. For more information on how we review video games and other media/technology, please go review our Review Guideline/Scoring Policy for more info. SNK Heroines -Tag Team Frenzy- is a fun game to waste some time with, however, the lack of optimization on the Switch port might turn off some players. It’s a silly game, there’s a lot of fun to be had, but the unsteady frame rate when in handheld mode coupled with the fact that the game CAN reach 60fps docked, but just doesn’t is extremely disappointing.